Anna Bolton | Greene County News John Caupp, chair of Greene County Board of Elections, looks through a bundle of unopened absentee ballots at the Nov. 20 meeting. XENIA — The Greene County Board of Elections certified the official results of the Nov. 6, 2018 General Election on Nov. 20, with no change in race outcomes. An automatic recount was not triggered for the Beavercreek City School District levy, which failed narrowly by 149 votes — made up of Greene County’s official results and Montgomery County’s unofficial results. An automatic recount would have triggered if the difference were 136 votes or fewer, according to Llyn McCoy, director of the board. McCoy said the board wouldn’t know until next week whether or not there will be an automatic recount. Montgomery County certifies their official results Tuesday, Nov. 27, which could add more votes to the total numbers. Before the certification, the board determined whether or not a bundle of unopened absentee ballots in question could be accepted as valid. One group of ballots included instances in which the voter listed his or her polling location instead of home address, with the correct home address listed on the label. These were ultimately deemed as technical errors, accepted by the board, and counted by staff. The board will meet next 4 p.m. Wednesday, Nov. 28, 551 Ledbetter Road, to determine the date and time for the audit of the general election. At that time, the board will also choose the method and the county-wide race to be audited. McCoy said the board processed more than 9,000 people for early voting at the Ledbetter Road office. “We had lines and unfortunately the lines are not because we don’t have enough voting equipment but it’s because we can’t put more than four computers in this room. That’s a problem,” she continued. While there were no problems on Election Day, she reported, long early voting lines especially impact elderly or disabled voters. McCoy said the board will discuss new voting equipment with the Greene County commissioners early in 2019. McCoy said she’d like to roll out new equipment in November, which would allow time for adjustment before the 2020 presidential election. 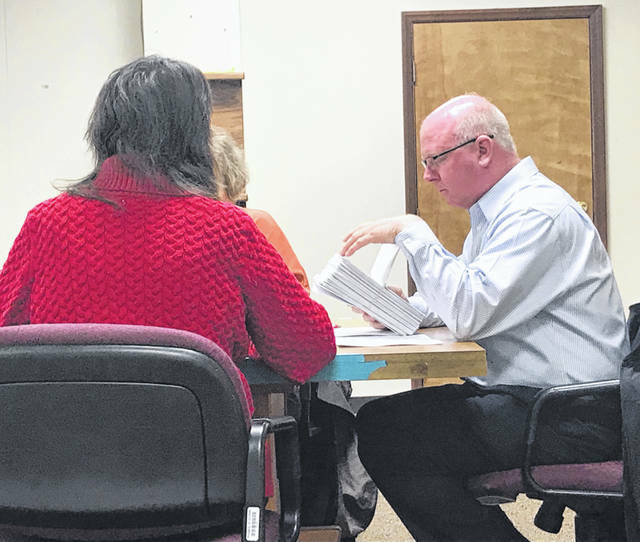 https://www.fairborndailyherald.com/wp-content/uploads/sites/50/2018/11/web1_Caupp.jpgAnna Bolton | Greene County News John Caupp, chair of Greene County Board of Elections, looks through a bundle of unopened absentee ballots at the Nov. 20 meeting.